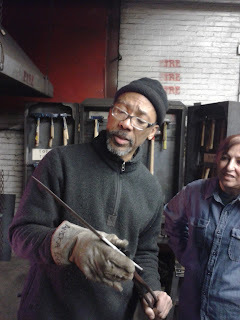 In March, I wrote a little bit about my bladesmithing class at MassArt with JD Smith. I wanted to write a little bit more about what I actually did in the class, what I learned from JD, and how my world of making has evolved. JD is a deliberate and clear teacher, whose strength as an educator perpetuating the craft lies in the universal respect he holds for his students and the standards he holds them to. He treats his students like the next generation of craftspeople. He speaks intelligently and coherently to them, expecting them to understand and to ask questions when they don't; to engage directly and honestly. In this way, he is able to ask his students to push themselves, to follow their intuitions but also to respect experience and perspective. The result is a knowledgeable and talented student base, with a great array of individuality in their work. 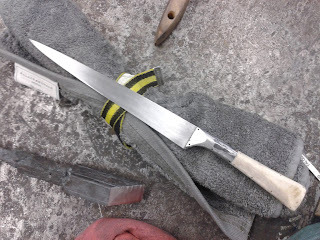 Anyone who has taken bladesmithing at MassArt is well-informed and interested. 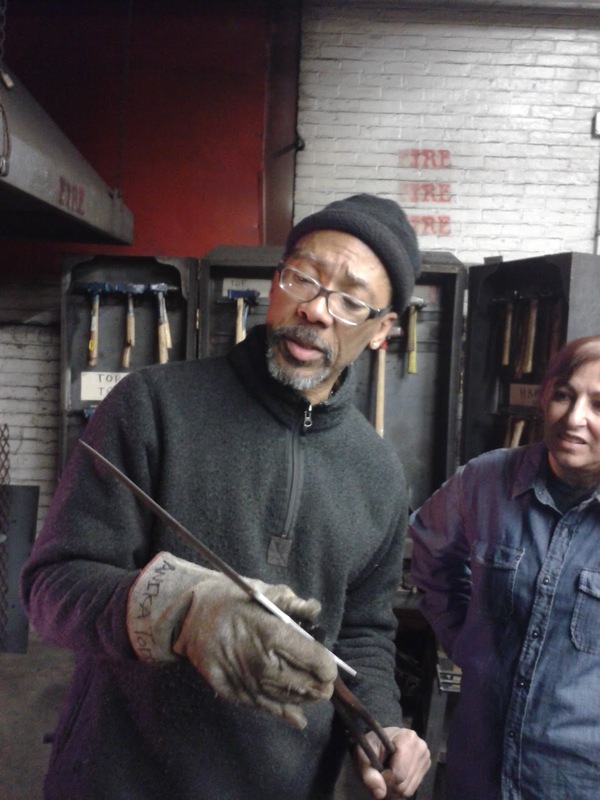 JD awakes both artistic passion and the seriousness of craft in his students, and is an invaluable asset to the growth and life of bladesmithing. As for his work, it's skilled beyond my ability to judge, and more something I stand in awe of. I might also add that he's a captivating storyteller and evident badass. If you find yourself in Boston, meet him. If you live there, take his class. Now to the technical stuff! 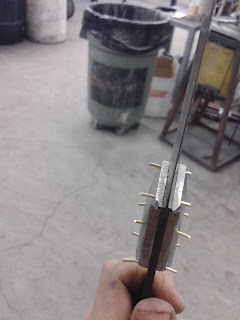 The materials we used in class were 1095, a simple low-alloy high-carbon steel, and 15n20, a steel that behaves very similarly in heat treatment and welds to 1095 very well, but contains a certain amount of nickel for contrast with the 1095. JD truly taught me how to draw, cut, and fold billets efficiently. We started out with eleven layers of laminated steel, and I decided that for my pattern, I wanted to fold it to about 325 layers and hand-hammer for random pattern. 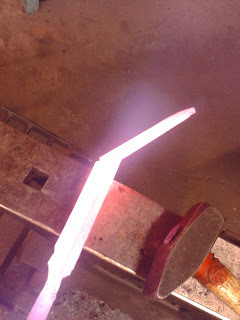 On the left is a billet cut for folding at welding heat. The billet was humongous, and I ended up cutting it in half. 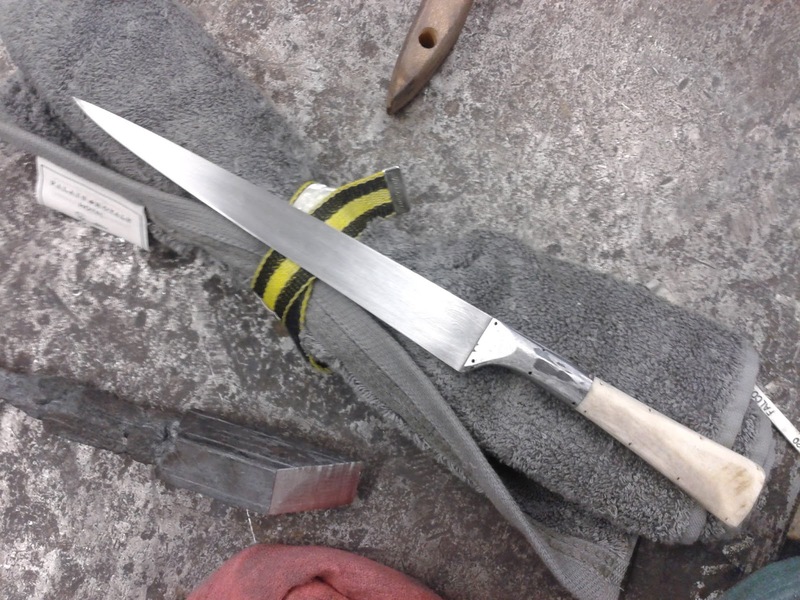 The first half was used to forge a knife blank that I ruined irreversibly while practicing a difficult but later rewarding grinding technique JD showed me. The second half was forged into the blank below, which was the first stage of creating a knife that is influenced, very much in form and function if not materials, by the native Persian kard (Farsi for "knife"). I'll go into more details about the artistic/aesthetic and cultural/historical details of the kard later, but right now I'm going to focus more on how JD's class has altered my style. 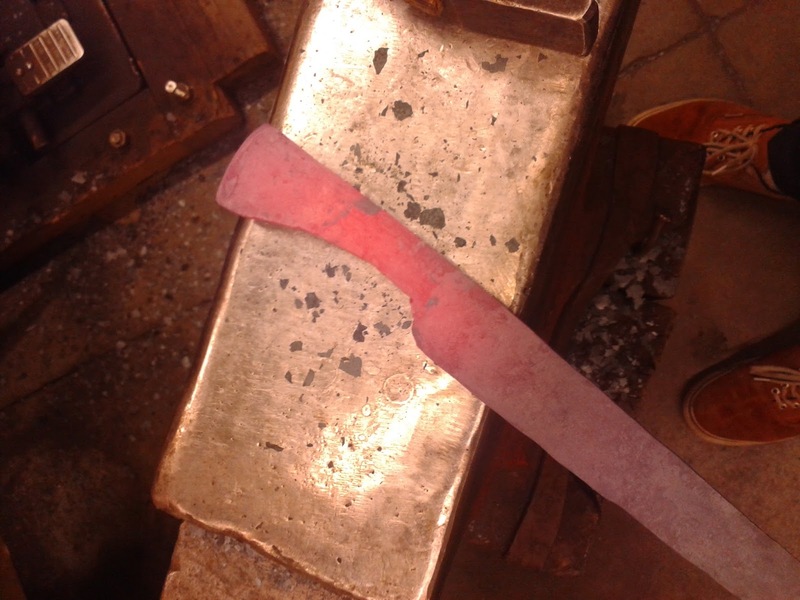 His forging is fast and efficient: he taught me that unless you have a specific pattern, there's no reason not to hammer the hell out of your billet on the fullering dies just to get the damn thing longer, because you have to do that quickly. The flat dies are for squaring things up later, but they'll make everything alright, so you might as well get the quick and dirty stuff done. Draw that billet out, square it, cut it, fold it, weld it, draw it out again. He works hard to facilitate the rhythm of production, an essential part of making things. The truly revolutionary part of the class for me was JD's well-explained and well-modeled grinding technique that gave me real insight on how you get an even grind. 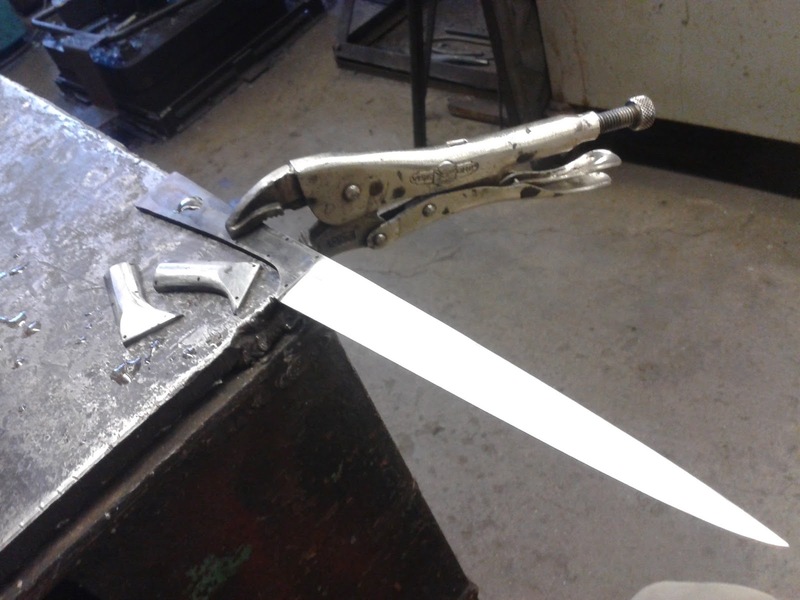 I'll say that Owen Bush taught me how to grind a sword, but JD Smith taught me how to grind a knife. Standing on one side of the belt, feet firmly planted, body relaxed, hands supporting but not truly gripping the knife, and constant, steady pressure (not too much!) against the belt. Starting in the same place every time and slowly letting off as you get closer to the tip, which has less mass. One aspect of making things that I have struggled with (as a natural perfectionist) is failure and compromise with my work. Basically, things rarely turn out the way you envisioned them when you're starting out, and it can be pretty heartbreaking. I'm not saying veterans are immune to this either. I had learned to do something about this, which was accepting flaws as an attribute of handmade objects, and to compromise with the object I was making. That gave me a turn. But I thought about it. A lot. And you know what? Steel doesn't have a brain. It's not going to outsmart you. It's going to do whatever you want it to if you give yourself the time to think about it and the space to execute it. It's not you against the material. You don't have to compromise with it, you have to learn to speak its language and then you can say whatever you want. If you learn Romanian, you can write poetry in it. How well is up to you. The above picture does a poor job of illustrating it, but I was very pleased with the evenness and beauty of the grind (read more of my obnoxiously spiritual musings on grinding). 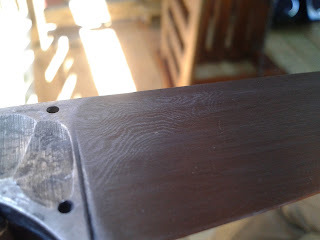 The next step was clamping the blade up and hand-polishing with a grit-variety of waterstones from Falcon Tools, which JD and his incredible apprentice Kevin Klein converted me to. I'm sick of sandpaper anyhow. Stones keep things much flatter and do things more quickly, in my opinion. There was much camaraderie among the students in the class at this point, as we all sat around a table with our blades clamped to it, stoning and talking away. 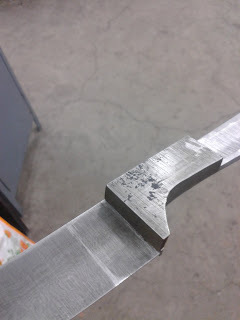 But soon enough our blades were hardened, sharpened, and etched, and it was time to begin working on handle materials. I learned some excellent techniques for flattening my surfaces and making everything line up, but I kind of love the freedom of making somewhat random shapes like the handle bolsters, much as I loved making the crossguard of my sword: they're three-dimensional affairs that you can really alter at will and aren't as automatic as grinding a blade. It's very freeing, feeling the weight of it and constantly eying it up and gauging how to get it where you want with a little grinding here and there. The picture to the right captures an interesting phenomenon that occurred during the heat-treatment of the kard blade: a hardness line that shows the molecular softness of the spine of the blade at the base by the tang, and the hardness of the rest of the blade running diagonally with it and in the rest of the blade. With all the parts lined up before final finish and assembly, I had again made something that was enough of an object now to give me a start. This thing is becoming real. I drew it, I messed around with a bunch of metal, and then now there's this real thing that was just thoughts and two-dimensional drawings. It was abstract made concrete. That's magic, if anything is. I don't think it will ever stop amazing me.